The risk of war in Asia will increase over the next 10 years as U.S. military forces struggle to maintain their edge amid declining budgets and increasing threats, according the chairman of the Joint Chiefs of Staff. 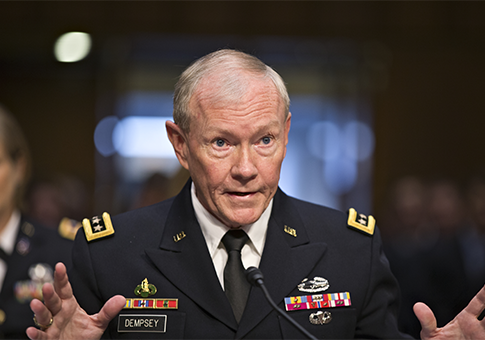 The dire assessment from Gen. Martin Dempsey, the chairman, is outlined in the Pentagon’s four-year strategy called the Quadrennial Defense Review (QDR) that was released Tuesday. Dempsey stated in the review that he believes the U.S. military will continue to be the most advanced armed force in the world. China was not mentioned by Dempsey as the source of a future conflict in Asia. But other U.S. officials have said Beijing’s large-scale nuclear and conventional military buildup combined with warlike propaganda produced by state-run media and increasing aggressiveness in maritime disputes has increased the risk of a war with Japan and other states. North Korea also remains a potential belligerent that could trigger a war. Daniel Russel, assistant secretary of state for East Asian and Pacific affairs, told a Senate hearing Tuesday that China’s aggressiveness in Asia is a worry.